Luckily, beetles are not so easily infected with diseases, and it is a rather rare event that a breeder witnesses a disease that kills all his animals. However, there are a few diseases and parasites that do infest beetle larvae. The below is an old article of mine, where I found some of my larvae suffering from the so-called black spot disease, which also has been described in LAI’s ‘For the Love of Rhinoceros Beetles’. I was lucky enough not yet to get this disease into my breeding room, hence no first hand experience. I was told that it often helps to keep the larvae at low temperatures and normally the larvae will make it into adulthood. But it will also transfer the disease to its offspring. I think by maintaining a certain level of hygiene, keeping temperatures lower (below 20 degrees) and with good substrate (By that I mean the perfect substrat that meets all the requirements of the larva, similar to where they would be found in the wild) it is possible to avoid major effects of this disease. And here is the older article. I would love to get your inputs on beetle diseases, so please comment. 1. This is a picture of Alomyrina dichotoma with blackish/ brownish spots on her body. I don’t know if it harms the larvae. It’s the first time I see it and only one of my larvae is infested with it. 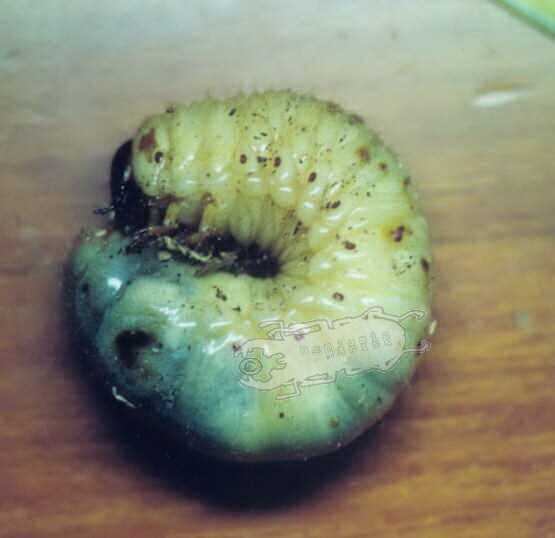 The larvae come up to the surface of the substrate and die. Then something like a mould, sometimes green, sometimes yellow will grow on the dead corpses. As this disease spreads through spores. you have to be extra careful, when you discover this disease. Through away the substrate infected larvae were found in and separate healthy and sick larvae, best thing is only one larvae per container. Wash your hands and tools after handling infected larvae and disinfect containers before reusing them. By all means, quarantine of newly acquired larvae seems to be the only way to keep out diseases of your own breeding. If you have any discovered anything else in your larvae, please let me know. yes, you are right. At the moment, as there are no medicines available, the only solution is to separate them from your other beetle larvae. I would even go so far as to suggest to move them to a different room.